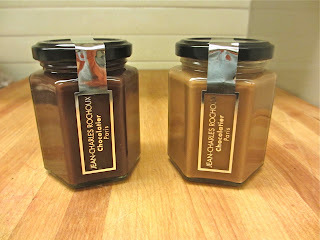 On my recent trip to Paris, I went to Jean-Charles Rochoux, at 16 rue d'Assas, to buy their hazelnut ("l'Enfance") and dark chocolate ("l'Age de Raison") pâtes à tartiner. I suppose the hazelnut's name reflects that this spread is like Nutella on culinary steroids, and I guess dark chocolate is considered a flavor for adults. No matter what, the chocolate is excellent and the hazelnut is far better than that!